Honda 8Hp Outboard, Honda BF8 SHU, Short Shaft, Recoil Start, Tiller Handle, 6 amp. This engine is the short shaft, pull start, tiller handle in the Honda 8hp range. This engine has 6 years Warranty (2 years for commercial users) and includes some great features like an auto start ignition system, engine protection systems and four blade aluminium propeller. Outboard comes complete with: Fuel line & fuel connectors, 12 litre fuel tank, charging lead, 6amp charging system, tool kit, and owners manual. RELIABILITY, Rubber pendulum engine mounts to help eliminate vibration, four stage corrosion protection, anode protection, over rev limiter, engine protection system includes oil pressure indicator light. 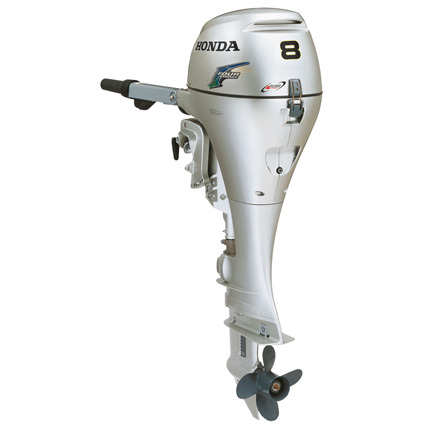 Honda 8Hp Outboard, Honda BF8 LHU, Long Shaft, Recoil Start, Tiller Handle, 6 amp. Honda 4Hp Outboard, Honda BF4 LHNU, Long Shaft, Recoil Start, Tiller Handle. Honda 5Hp Outboard, Honda BF5 SHU, Short Shaft, Recoil Start, Tiller Handle, 6 amp.